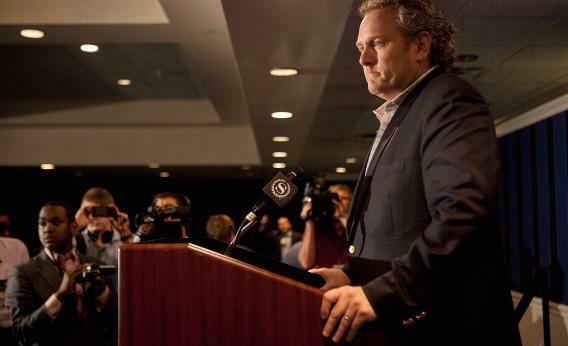 Andrew Breitbart—the former Drudge Report guru, the man who co-founded the Huffington Post and published the ACORN sting—has died at age 43. Big Journalism, the media watchdog site in Breitbart’s “Big” network of blogs, was first with the story. In the age of Twitter, a medium Breitbart used to mock his critics, retweeting them for his own amusement, this wasn’t enough to convince people. I confirmed it with some members of Breitbart’s team, who were holding off on saying more. Nobody saw this coming. I chatted with Breitbart on Saturday, in Michigan, where he was giving a speech to an Americans for Prosperity conference, and he was as hyped-up and funny as I’d ever seen him. He polled me for my take on the GOP race, then mused that it must be incredibly boring to cover. Back in 2010, Christopher Beam profiled Breitbart for this magazine. It was one of many profiles Breitbart sat for that year, and it was typical: He gave Beam oodles of time and access, walked him around his world, and gave him more verbiage about his philosophy than anyone could ever cram into an article. This year, Breitbart walked me and other reporters around a house he had rented in D.C., joking about his enemies, rewriting the lyrics of some World War II doggerel to make them about his enemies. Breitbart was like that: completely unafraid, confident that he was on the side of truth and justice. Of course, he would only say something like that in order to make fun of the cliche. UPDATE: I’m writing a longer piece about the news and talking to the people who make up the Breitbart blog empire. The man’s name was at the top of the breaking news/video site Breitbart.tv; the Big blogs are edited by Joel Pollak, with individual editors at each. CNN contributor Dana Loesch runs Big Journalism; Peter Schweizer, author of the book that started the STOCK Act stampede at Big Peace; and so on. The Bigs rent a house in D.C., next to the Supreme Court. I’m told that nothing is changing; as proof, one journalist in the Breitbart network called me back en route to an investor meeting.